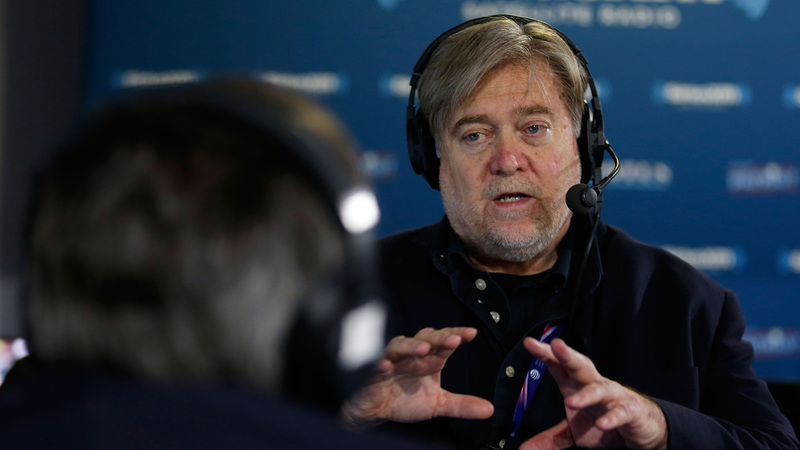 President-elect Donald Trump announced on Sunday that he will be appointing Steve Bannon, the Trump campaign CEO and former executive chairman of Breitbart News as his chief strategist and senior counselor. Unfamiliar with Bannon? Here’s what you need to know about him (even if you don’t really want to). 1. He transformed Breitbart News into an alt-right destination. Prior to Bannon’s taking over as executive chairman in 2012, Breitbart News was fashioned as a “Huffington Post of the right.” Once the site was under his direction, Breitbart began catering to people on the far right for whom white nationalism is a key tenet. Per HuffPo, “The website traffics in misogynist and racist stories; it frames women who push back against harassment or gender bias as weak and incompetent and portrays people of color and immigrants as inherently criminal.” Earlier this year Breitbart’s editor-at-large quit in protest of the site siding with the Trump camp over its own reporter Michelle Fields after she accused then-Trump campaign manager Corey Lewandowski of assault. 2. He suggested that black Americans are “naturally aggressive” and that those who get shot by police “deserve it.” Here, you can read it for yourself in his own words from a July 2016 post. 4. On the other hand, white nationalists are super-psyched about his nomination. As the Southern Poverty Law Center reports, among many other fans of Bannon’s appointment, Ken Reed, the national director of the neo-Nazi group Aryan Renaissance Society, posted a story about the appointment to Facebook with the comment, “Can you say WINNING boys and girls?? ?” including the hashtags #WhiteLivesMatter and #AltRight. 5. He’s been accused of anti-Semitism. Earlier this summer the New York Daily News reported that Bannon’s ex-wife, Mary Louise Piccard claimed that Bannon didn’t want the couple’s twin daughters attending an elite Los Angeles school because of the number of Jewish students there. “He said that he doesn’t like the way they raise their kids to be ‘whiny brats’ and that he didn’t want the girls going to school with Jews,” Piccard wrote. 7. His appointment was a political maneuver. On Sunday, Trump also announced that Reince Priebus, the chairman of the Republican National Committee, would be his chief of staff. This news displeased Trump’s grassroots supporters who never forgave Priebus for having the temerity to criticize Trump during the campaign. The New York Times points out that in Trump’s statement, Bannon was named first and that Bannon was reassured that Trump, not Priebus, was his boss. “I probably would have preferred Bannon as chief-of-staff and Priebus as press secretary,” writes Andrew Anglin at his neo-Nazi website Daily Stormer. 8. He’s Seinfeld rich. After serving in the Navy and doing well in mergers and acquisitions at Goldman Sachs, Bannon bought a share of royalties of Seinfeld back in 1993 and enjoys the payouts from it to this day, according to The New Yorker. It’s a little ironic that the Bannon’s pockets are lined with profits from a show about a liberal Jewish comic. Keep this in mind next time you’ve got TBS mindlessly blaring in the background. 9. You can join his many critics and speak up. Don’t just get angry. Speak up. While the Senate cannot block Bannon’s appointment, its individual members can voice their constituents’ concerns and, ideally, convince Trump that this choice is too alienating to stand. Call your senators and representatives and urge them to make a statement reflecting your outrage. You can also contact Speaker of the House Paul Ryan’s office at 202-225-3031 and Majority Leader Mitch McConnell at 202-224-2541. Don’t be intimidated — it is their offices’ job to listen to you and make sure your voice is heard.